The 16 x 20 Wooden Garage Barn Mezzanine offers wonderful flexibility to make this generous space your own. A perfect representation of the classic garage, it’s simply stunning. The Barn Mezzanine wooden garage can easily be a multifunctional space with room to grow. Work on your hobbies with plenty of room to spread out. Light, bright and lovely with gorgeous lattice windows, this wooden garage has it all. With a barn-style roof and gorgeous barn doors, the Barn Mezzanine wooden garage gives you plenty of features to make life easy. If you would prefer a traditional roll-up door, we are able to supply this direct to you at an additional cost. 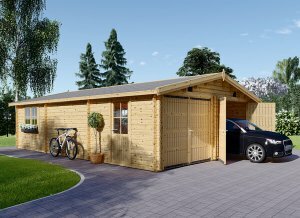 Made from slow grown conifer timber, the quality and insulation of this wooden garage is top notch. The tongue and groove, interlocking corners ensure the wooden garage has continued stability over time. This combined with reinforced roof construction and thick roof joists maximizes the safety of your wooden garage. External dimensions (width x depth) 16'5" x 19'6"
Internal dimensions (width x depth) 15'7" x 18'9"
All of our wooden garages come with solid constructed double garage doors (optional), which are equipped with massive steel hinges and reinforced with steel frames. Our wooden garages come with double-glazed windows and doors that employ finger-joint technology that significantly reduces moisture in the building.